May 6th, 2016 - Posted by Steve Marks to MySQL, Web Development. July 1st, 2014 - Posted by Steve Marks to MySQL, PHP, Web Development. June 16th, 2014 - Posted by Steve Marks to MySQL, Web Development. 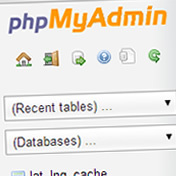 January 27th, 2014 - Posted by Steve Marks to MySQL, PHP, Web Development. January 24th, 2014 - Posted by Steve Marks to MySQL, Web Development.